The 142,000-square-foot structure is distinct as it will blend an innovative learning environment with a luxury boutique hotel and restaurant. No other facility has a teaching hotel, teaching restaurant, a range of classrooms, demonstration and food production laboratories, a food hall, wine appreciation center, distilled spirits center and brewing science lab under one roof. Such an educational platform will inspire students to plan, market, manage and evaluate a commercial hospitality operation, while at the same time provide them with cutting-edge opportunities to develop technical and leadership skills. Creating a facility at Auburn that could address the growing hospitality industry and advance the instruction of students interested in culinary and hospitality careers began more than a decade ago when Martin O’Neill, head of the Department of Nutrition, Dietetics and Hospitality Management, and Hans van der Reijden, managing director of The Hotel at Auburn University and Dixon Conference Center, began benchmarking globally recognized programs and facilities. Leath said Auburn responded to hospitality industry growth “the best way we know how — with premier academic programs and scholarly research that continues to shape our global footprint. Auburn’s plans for a culinary science center received significant encouragement in 2017 when James W. “Jimmy” Rane and the Rane family made a $12 million commitment to the building’s construction. Rane is a 1968 Auburn alumnus, longtime member of the Board of Trustees and chairman, president and chief executive officer of Great Southern Wood Preserving. The board later approved naming the facility in honor of his parents, Tony and Libba Rane. Trustee Rane said that his parents were passionate about hospitality, and “they loved to entertain.” Bestowing their names on a building dedicated to hospitality and culinary science was a true blessing for him and his family. Henton said the naming of the center was especially meaningful to those in the college who had met Tony and Libba Rane. “It is a great honor to be entrusted with this responsibility of carrying their legacy of ‘la famiglia’ going forward,” she said. Construction of the Tony and Libba Rane Culinary Science Center at the corner of East Thach Avenue and South College Street will begin in the coming months and is expected to be complete in 2021. 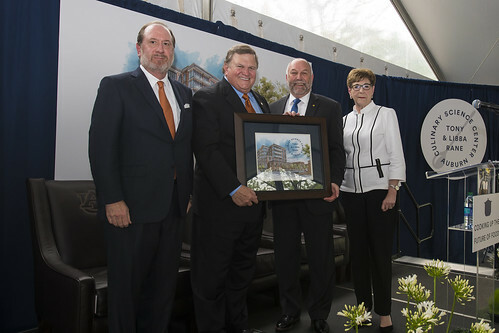 Auburn University Trustee Raymond Harbert, Trustee Jimmy Rane, President Steven Leath and College of Human Sciences Dean June Henton stand together after Rane was presented with an artist’s rendering of the Tony and Libba Rane Culinary Science Center, a new education building coming to Auburn in 2021. Tony and Libba Rane were Jimmy Rane’s parents. 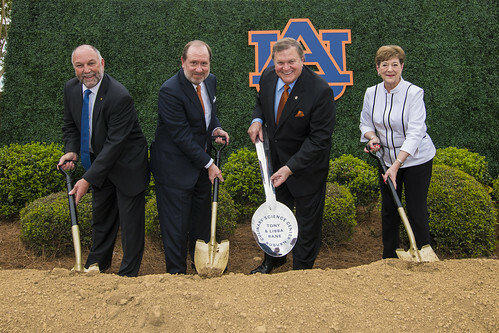 Auburn University President Steven Leath, Trustee Raymond Harbert, Trustee Jimmy Rane and College of Human Sciences Dean June Henton participated in a ceremonial groundbreaking on April 12 for the Tony and Libba Rane Culinary Science Center, a transformational education complex coming to Auburn in 2021.